In the spirit of the season, I'm going to try to do a few gaming related posts this week. First up, my EVE Online alliance, Ushra'Khan, has an excellent entry in the new EVElopedia, thanks to alliance member Ugleb. There are a couple other unofficial EVE wikis around, but generally wikis benefit when there is one canonical wiki, so hopefully the official EVElopedia will become a strong resource, especially for histories of player-driven events. For example, U'K is moving to a more forward base right now, which is the first player-built outpost I've been in. I'd like to know a little more about the history of the outpost, when it was built, who has occupied it, etc. Once the EVElopedia is more integrated into the EVE client, hopefully this kind of information will become more easily accessible. Anyhow, for the three people who will actually look at the article, what's interesting to me is the interaction between the official EVE storyline as written by CCP and the player alliance history. 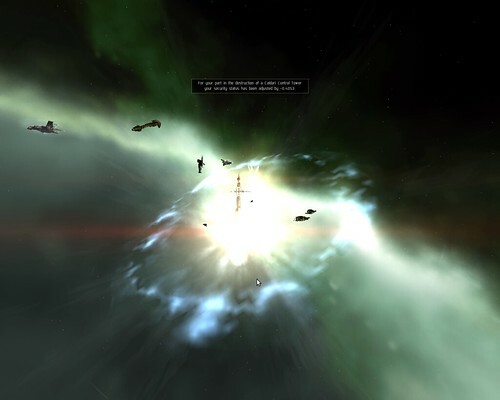 You start out with pure backstory, then much of the history is a blend of the two -- in the early days of EVE CCP created events that role-playing alliances could participate in as part of the main EVE timeline. So Ushra'Khan's early history is intertwined with the official EVE storyline. As EVE has gotten bigger (around 300,000 players) and due to some scandal where CCP employees were helping out their own alliances, they've stopped holding these events. This has led to a general decline in EVE role-play and makes many long-time Ushra'Khan pilots sad. But, in EVE, we can still write our own history, and the alliance has been lucky to pick up a couple of the best EVE bloggers in recent months, so the more recent combat exploits of our band of freedom fighters can be followed at Ombeve's and Wotlankor's blogs, including Wotlankor's account of this weekend's carrier kill. Don't Blame Us, It Was TFA! Confused About What US Autoworkers are Paid?